Let's start with the price tag of the project because that's probably the first thing that's going to catch people. So we looked up data in an attempt to get some perspective. The proposed Albany High School project would cost about $344 per square foot, and $65,333 per student (assuming capacity of 3,000 students). According to the School Planning and Management 2015 school construction report, the median price per square foot of new high school construction in the region that includes New York State, New Jersey, and Pennsylvania was $333 per square foot last year -- and $63,120 per student. So the AHS project is a little bit more expensive than a "typical" project in this part of the country, but it doesn't appear to be outrageously so. Of course, the real issue for a lot of people probably isn't the total price tag -- it's the tax impact. About 63 percent of the cost of the project will be covered by the state, thanks in part to a strategy in which the district will stretch the construction timeline over seven years. That leaves people in the city of Albany to directly cover more than $72 million. The district figures the high school project will have a tax impact of $60 annually for a home assessed at $200,000 (with a basic STAR exemption). But as Chris Churchill has highlighted over at the Times Union, the district's math on this is just one interpretation of the tax impact because it treats what people currently pay as a baseline -- and that current level includes debt that will expire. When the increase is calculated assuming a baseline in which the debt expires and is not replaced -- so, there's no high school project -- the tax impact for a $200,000 home is $267 a year. The district and supporters of the high school project have argued the tax hit -- under the district's calculation -- is a relatively small one for most people, just a few cents per day. So how can you argue against chipping in an extra $60 a year (or so) for something as significant as a new version of the high school? Well, here's the snag: the city of Albany already has the second-highest combined property tax rate in the Capital Region (2013 numbers). And its school tax rate in 2013 was the highest in the region -- more than $2 per thousand in valuation higher than the next highest. Saying it's just another $60 per year is a little like going up to a person struggling to carry a load of bricks and saying, "Hey, you wouldn't mind if I added another brick to your load, would you?" That's not to say the high school project isn't worth it. People may very well decide the benefits outweigh the additional cost. But it's also understandable that people are wary of taking it on, no matter how relatively small it might appear. Many of the parts of the building we saw recently on one of the public tours weren't overtly dilapidated -- just sort of plain. 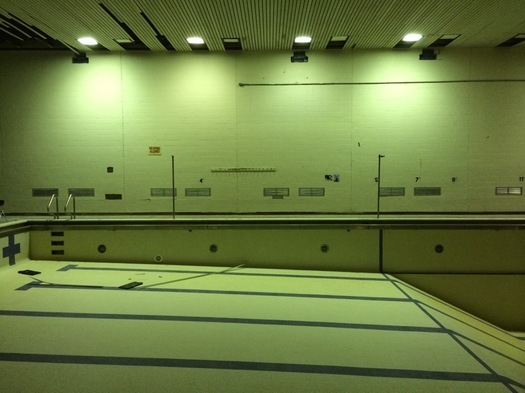 It is also, according to the district, currently in significant disrepair. A large wall is crumbling. The roof leaks in multiple places. The heating and cooling system doesn't work consistently. The building isn't even that old. It was constructed in the early 1970s. And apparently planning for major renovations or replacement has been going on for at least a decade. So the current AHS won't be going down in the annals of great Albany architecture and infrastructure. Nor, for that matter, will the efforts of previous generations in making decisions about how to maintain the building. The crumbling wall. Apparently those holes at the top are covered by tarps. 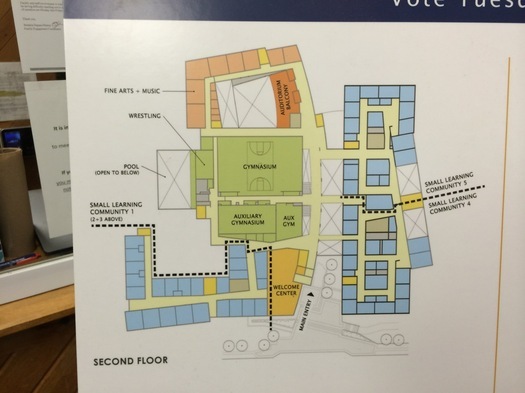 The district says the high school renovation project would allow it to more effectively reorganize the school into six smaller "learning communities" -- in which students and faculty would have more consistent interaction -- by physically grouping many facilities for each community. 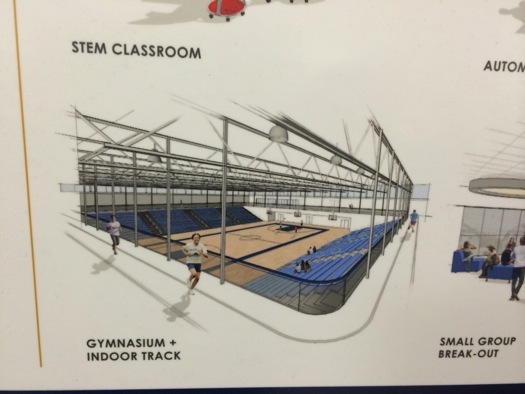 It would also add capacity for enrollment that's expected to grow to 3,000 students (from about 2,500 currently); allow for the career and technical education program to be part of the main high school building (it's currently in a building off campus a few blocks away); and it would involve significant upgrades for classroom and lab technology. 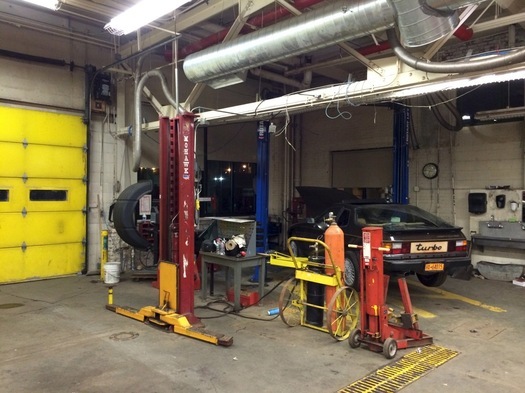 The auto shop at the current Abrookin Career and Technical Center. To us, the most compelling reason for completely overhauling the current school might be the incorporation of the career and technical programs into the main building. The current setup -- in which students walk a few blocks off campus -- seems inefficient. And bringing these programs -- such as automotive, construction trades, culinary, and cosmetology -- into the main building would not only make them more accessible, but also maybe allow them to play a more central role in the curriculum. In response to the almost-$200 million price tag of the proposed project, we've seen some people ask if it really needs to be that much, and whether there are elements that could be dropped to get the price down. So we're curious if there could have been some way to present a range of options for a vote. If voters don't approve the proposed major renovation of Albany High School, the district says the school will require roughly $100 million in work -- both to fix things that are falling apart, and to accommodate the projected enrollment increase. Maybe the district figured it would aim for what it really wants, and be prepared to fall back to the minimum it needs to get by. An indoor track would be nice. But some people might see elements like that as unnecessary icing. The Albany school district doesn't have the best reputation. A high school graduation rate of roughly 50 percent will have that effect. And the district's strong points -- some much-appreciated grade schools, an honors program that routinely sends students to top colleges, and what are apparently some really great teachers -- don't tend to get a lot of attention with the wider public. One of the arguments proponents of the high school project have made is that building this renovated/new school would be a powerful signal to people that Albany values education. And it might even prompt more families to keep their kids in the district's schools. We have to admit we're not sure what to make of this argument. It does appear there's a significant gap between the broader public's perception of Albany schools and the positive experience that many families have with the district. Maybe a shiny new high school changes the course of that public conversation. But unless some of the district's outcomes change -- especially the graduation rate -- it's kind of hard to see the building making that big a difference in wider public opinion. To this point we've been circling around a core issue with the Albany school district, one that's connected to pretty much every other issue: the district has a lot of students who live in poverty. (More than half of the high school class of 2014 was considered "economically disadvantaged" by the state Education Department measures.) And growing up that way is playing the game on the hardest setting. So, a person might say, the "problem" with Albany High School isn't really that its building is in bad shape -- the problem is that many of its students are facing tough odds before they even reach the front door. And no matter how much money you pour into the building, little is going to change until there's a way to help these families address their economic circumstances. In fact, that Albany High School already turns out a significant number of students who end up doing well academically is evidence that it's not really a problem with the building. There's undoubtedly some truth to this line of reasoning. But it discounts the fact that a school district is one of the few ways the community at large can directly intervene in a kid's life. Can Albany High School be one of those ladders, as a place of structure and support, of opportunity and encouragement, a safe place for kids to do the things kids should be doing, like learning, playing, and growing with their friends? The answer to that, like so many questions, is probably "it depends" -- on the people who run the district, on the teachers in the schools, on the families involved... and, to some extent, on the actual school buildings. And the degree to which you think the building itself matters on this question is probably an indicator of how you'll vote. Thanks for this. This vote is one of the rare times I'm one of the "undecided" right up to the eve of the election and I have to make up my mind by tomorrow. I don't think I've ever voted against a school budget or school-related project, but that price tag is a killer. I agree with chrisck. I know something needs to be done but there are way too many variables in the situation. Plus the whole "we must do this gajillion dollar option it's the only option there is no other option" approach rubs me the wrong way. I like a contigency plan. It will rank as one of the MOST expensive schools in America.....For the love of God Abraham Lincoln sat in a one room school house with a candle and changed the world! I would agree to this if every Administrator in the district took a 15% pay cut! I know it's only another $211 dollars for a $200,000 house blah blah...do that 10 or twenty time and it starts to add up.....having said that the KIDS do deserve this but as we all know in the game of guberment it's never really about the kids!! PS PLEASE IF YOU DO BUILD IT DO NOT MAKE IT RESEMBLE A PRISON like the current high school...shoot for $200 million it should look like the Taj Mahal!!!!!! For the hundreds of parents like myself who have young kids and live in Albany... we are continually on the fence about whether to stay or go, and are starved for something more than just an anecdote about how someone's kid happened to navigate through the Albany school system successfully. Is a $200-million renovation project the answer? Who knows. But at least it's a tangible step in a direction that makes me think people aren't satisfied with the way things are. Thanks for pointing out that the school needs $100m in renovations/repair in any case. This has been lost in most of the discussion and should really be at the top. Right now the project is framed as "should we do this $200m project?" when it needs to be "since we have to do this $100m project, does it make sense to do this $100m more?" It's sort of like making the decision to repair or replace an old car. Speaking of, whose 944 are they working on in that shop? Nice. While I am very "pro" public education, I voted no this morning on the Albany High initiative. First, I wonder aloud if public education will match the design above by the time the project is paid off. Will we move to remote or virtual locations? Second, a new building doesn't address income inequality, which seems to be more the heart of the matter. Last, the issue almost reached "propagandic" levels via the Albany school system's newsletter & in the media. A little balance, people! I agree with BS - a new building is nice, but its the people and the culture that will generate successful students. Invest in some repairs and give the teachers a raise. I don't think the median price per square foot for New York, New Jersey, and Pennsylvania is a good metric. It doesn't give any information about the kinds of work done. 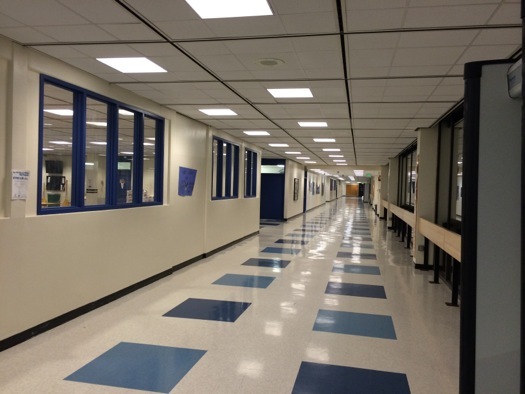 My high school was able to do a massive renovation (~144,000 sq ft rennovated, and 152,000 sq ft of additions) for $28 million. This was 10 years ago, but prices couldn't have gone up much since then. Also, Vestal had a 270,000 sq. ft. project that completed in 2009 for $22.5 million. For $196 million at $344 per sq. ft, that's a 570,000 sq ft project, or about double the size of the projects above. 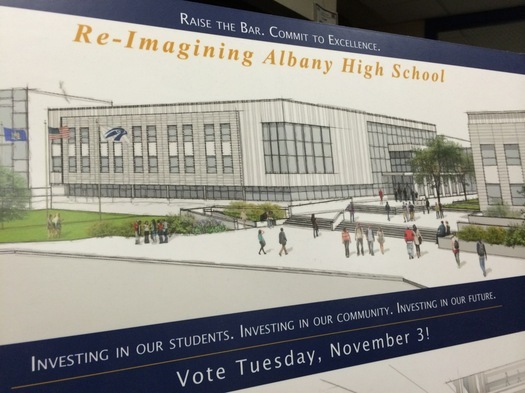 I don't see how the proposed changes to Albany High could approach $100 million, let alone $200 million. Thank you for the thoughtful, balanced piece, AOA. I'm really on the fence about this one. The real problem with Albany schools is the poverty that many students face. I can't help but think that money for things like universal healthy breakfasts and lunches, after school extracurricular activities, music and sports programs, and teacher incentives are the best way to spend the money. Buildings matter less. (Similar story at UAlbany where there is a shiny new campus center being built as graduate student fellowship lines are cut and core academic programs (French, theatre, Russian) are being shuttered.) All these considerations incline me toward thinking that people should vote "no". On the other hand, Albany high has some excellent programs and some really great teachers. Considering all the economic challenges many of its students face, it performs well (and much better than our middle school). It is the only high school in the city; it should be a beacon, not a shambles. The students should feel proud of it, and happy to go there. This makes me think that people should vote "yes". Many of you are expressing the same sentiments that I have. I have children at the High School. The school definitely needs some renovation and a little more space. It also does need a new roof and HVAC system, as would be true of any building this age - replacement of these are a given and should be budgeted for. However, the building is not "a shambles." The inside scoop from the kids I talk to is that "yes, they would love a new, shiny school, but this one isn't as bad as everyone says." The current building has some design flaws, such as lots of inside rooms with not natural light. I am not sure that we won't be saying the same thing about this proposal in 40 years, though. I think I am voting no, especially since - for those of you who don't have kids in the schools - there is a growing space squeeze at the middle school level, and I wouldn't be surprised if a real need for a new building or two comes down the pike very soon. Maybe we can come back to the drawing board with a scaled down plan and wiggle room for our need in the not so distant future. @Sean -- I appreciate the spot you are in, but "Who knows" is not a good enough rational for a $200 million construction. And it's not just families on the fence as to whether to move out of Albany. I'm a retiree who does not want to move out of Albany either (I pay my taxes, spend my money locally, volunteer in my community), but many retirees are also fleeing because of the high taxes. I don't mind paying for your kids' schooling, but I need more than "Who knows" to vote yes on this costly school renovation. The projects linked to in the comments above are not comparable to the plans for a new Albany High School. The new school will include space for the arts and the Career and Technical education programs. I hope anyone with questions about the size and scale of the project took one of the many tours the district offered. Please consider that the price tag for Albany residents is $72 million and we pay for the additional NYS funding whether it comes to our district or not. In terms of leveraging our local tax dollar, this school is a very good investment. This is a really good analysis, I wish the community had the chance to benefit from it earlier in the process (but I know the AOA folks are always busy hammering out good products for us, so no fault of their own). There are two really big points that I felt should have been better emphasized and communicated over the past few months, for there has been a lot of confusion by residents/tax payers without the clarification (often poorly communicated by the school district or purposely muddied by opponents). The first is the cost of maintenance that will need to be absorbed over the next 5 years. The figure is debatable, but an estimated $100 million in anticipated updates and maintenance will be required. As previously pointed out, this presents the voter with two options: 1) Dig in with the current building and reinvest; or, 2) Start over and modernize. Again, there are competing opinions within these options, such as repurposing current infrastructure (more environmentally friendly), what modernization really means and whether that can be achieved through the current building or only through a new facility, and whether we can achieve the same objectives with less expense. The second confused point has been why we arenâ€™t using the money elsewhere. Simple answer: we canâ€™t. This is a bonding vote, so only capital expenses count and the state will be subsidizing a significant majority of the project. So we canâ€™t just move that money to more teachers or programs, because that is ineligible under NYS bonding. If anything, the bonding will help amortize the building of a new school and prevent tax payers from having to pay for maintenance on the current building, freeing up money for teachers and programs. There will be a slight uptick in the taxes you pay, but things could be worse if we have to absorb wholesale facilities upgrades within one year rather than amortize over a longer period of time. @chrisck : During the process of listing-out your social resume, I think you misunderstood my comment. But that's ok - I'll clarify. Is this proposal worthy of our money and our vote? "Who knows". There are obviously a million factors for everyone to individually consider. As someone with young children, part of me thinks that it's nice to see efforts are being made to improve the school conditions that my children may eventually inherit, and in a tangible way. Does this mean it'll get my vote? "Who knows." I have 999,999 more factors still to consider before the end of the day. Not a very attractive building. No Dutch architecture? No natural light in every room? No green or solar roof? I have to agree with Jason, though: "I can't help but think that money for things like universal healthy breakfasts and lunches, after school extracurricular activities, music and sports programs, and teacher incentives are the best way to spend the money." And I agree with him also that UAlbany's spending priorities are grossly wrong.